What should you do if you’re invited to judge at a beer competition? Take it seriously. It’s not just a free piss-up – whatever some people think or say. Winning an award can mean a lot for a brewer. Not only is it nice to have your beer appreciated and recognised for its quality it’s also an excellent opportunity to publicise a beer or mention the award within publicity and other communications (including talking to publicans or other customers), on labels/pump clips and online. Plenty of beer buyers and drinkers will choose a beer they can see has won an award over one that hasn’t. Savvy brewers shout it from the roof tops when they win a medal or competition. As a beer judge – you are one of the people responsible for choosing which brewers get to shout. Always keep that in mind. If a beer tastes brilliant and is in excellent condition score it highly, but if it tastes unbalanced and is in poor condition then feel free to give it a low or even a zero score. Give feedback to competition organisers about any problems with dispense or beer quality during and after any competitions you judge at. Beer needs to be served perfectly if it is to stand a chance of winning an award. All that said beer judging is also fun and enjoyable! You’ll meet interesting people, including brewers, and there’s the chance to learn by observing other people judging. Whether you’ve judged hundreds of times or it’s your first competition there is always something to be learned. In the best competitions tasting is blind. This means you won’t know what the beer is. If you knew what you were sampling it’d be too easy to select your favourites and discard things you’ve disliked in the past – no matter how hard you try to be objective! Samples are numbered to enable accurate recording of scores and/or comments for each competing beer. You will usually be given a score sheet and perhaps asked to mark beer out of 10 or 20 for various criteria (appearance, aroma, taste, saleability etc) or to rank the top three beers from each ‘flight’ (the group of beers you are judging – usually all of one style). It is your opinion of the beer that counts. But in some competitions, such as the World Beer Cup, the table has to reach a consensus as to which beers deserve to go through to the next round. If this is the case you need to keep your opinions to yourself until all the judges have completed the flight. Sometimes it’s easy to reach consensus as the best beers are obvious – but sometimes it can result in heated debate about what does or doesn’t deserve to go through. Beer judging is also an excellent way of learning about beer or keeping skills up-to-date if you’re already an expert. 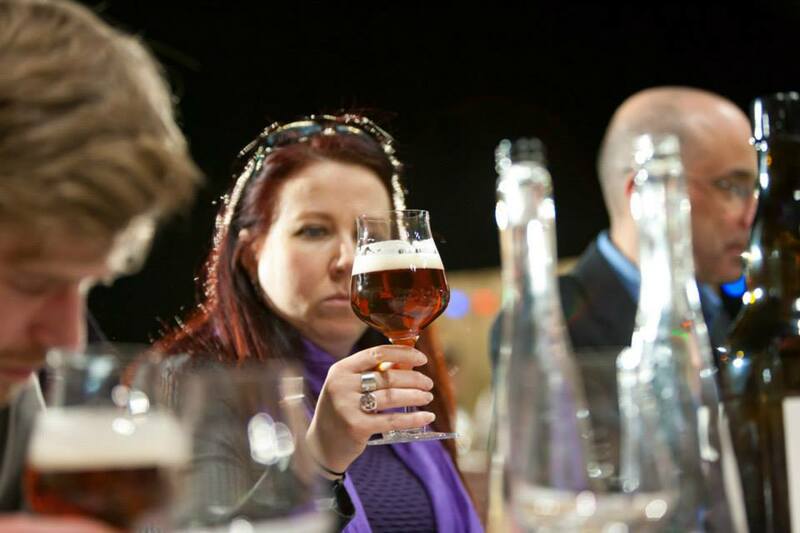 Some competitions only use experienced judges – some like the International Brewing Awards are judged only by brewers. Others benefit from a much broader range of skills and experience, especially when saleability is one of the criteria when it’s vital to have ‘average’ drinkers and pub-goers on the panel. ● Be sure to have had a decent, preferably cooked, breakfast before you start (assuming you are judging in the morning – a decent meal if later in the day). ● Do not wear aftershave or perfume on a judging day. ● If you normally like smellies consider using unscented deodorant, soap, body lotion etc on judging days. It may sound a bit over the top – until you’re sat next to someone with overpowering scent on and all you can smell and taste is their perfume! ● Sip water between each beer, eat a bit of cracker/biscuit/bread (these should be provided by the organisers) and have more water every few beers and whenever you feel your palate is tiring. This will also assist in terms of not becoming intoxicated, particularly if judging high ABV brews. ● Have a decent lunch if judging/continuing to judge in the afternoon. ● Form your own opinion of the beer before discussing with other judges. ● Do not let on if you think you know what beer it is you are tasting. ● Trust your instincts and senses and mark accordingly – don’t be kind if a beer isn’t up to par. ● If judging for saleability think beyond whether or not you would buy it. Think about how popular it might be with the average drinker and how quickly a pub might turn over a cask. I quite often give high marks for saleability to rather boring beers! ● Learn from the experience, by listening to the opinions of fellow judges but don’t be bullied or swayed if you think they are wrong. Some judges are more skilled than others and the best judges know there is always more to learn. ● Take it seriously but don’t forget to enjoy tasting the beers. What is a beer judge? Next Probably afraid of craft beer? Good stuff. But isn’t that the problem with “saleability”? We’re not judging the beer, we’re attempting to judge the taste of the “average drinker”. How are we qualified to do that? Isn’t it about our prejudices regarding “their” prejudices? Thanks for the feedback Jon. I think you’re echoing what I was trying to say about needing judges of all levels of experience. Whether you’re a brewer, beer writer, beer sommelier – whatever – once you are in the ‘beer bubble’ it is hard to get a handle on the mores of the drinkers outside of it. High marks for boring beers? Very open minded way to judge beers. I did not mean that to be offensive! Hundreds of beers are now made and I’m lucky enough to try more than my fair share. I find some of them boring but I recognise this doesn’t mean they are ‘bad beers’. They are simply not to my taste. So what I wrote about high marks for boring beers was an effort to say I try to be an objective beer judge even though subjectively I find certain beers dull and would not drink them by choice. The issue of up-marking boring-but-saleable beers is a tricky one, especially if you aren’t given sufficient information about the intentions of the brewer. If I’m told the style category is an ‘English Best Bitter’ and I find it fairly bland and malty and dull, I won’t mark it down based on my personal prejudice against this style, because the beer is doing what it’s supposed to, and it’s a style that is popular with a lot of drinkers. If it’s a less formalised contest, or judging an overall winner, and the same beer is up against a rich Imperial stout and a spritzy, hoppy pale ale bursting with citrus notes, then of course, I won’t mark it very highly. It’s all about context, and understanding your brief as a judge.